I know I am in the middle of making a new video, and I get side tracked, but thanks to a member on the AcePC forums I am working on a cooling upgrade. First we need to get this thing apart. Remove your hard drive bay. Then there will be four rubber feet. Below each will be a screw. Remove all the screws, flip the Replay back over, and you should be able to now get the top off. Now that the top is off you can remove the socket going to the LED to get the top all the way out of the way. After that undo the black tape around the wires near the corner and remove the one further away from the corner to unplug the fan. Like this. 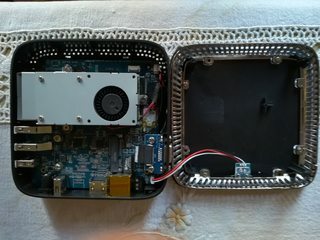 Around the fan and shroud there should be three spring loaded screws holding things to the board. Once you get them out carefully twist and rock the shroud around to free it from the board. The piece should come loose, and under it is a thermal pad that will need removed. Now that the everything is free we can take apart the cooling set up here. I didn't think to take a picture before i started popping screws out. I had a hard time getting the bottom two out, and I had to end up yanking them out. However from the bottom two there are a matching top tow. Then next to that there was on one the top and bottom to hold the fan in. Once you get the screws out there is a massive amount of glue. With the screws and glue clear you can now gently bend the shroud. Once you get the little metal bar out of the way you should be able to get the fan out. Now we can install a new fan. Thanks to actiftech over at the AK1 fourm here. He mentioned using a noctua NF-A4x10. I ordered, and then I realized that the link he wrote was to the 12 volt version. So I canceled. I then found and ordered the 5 volt version here. Once it comes in doing things in reverse to get it in, and then adding some thermal compound where the pad was (I will be using this) should get us some cooler temps, and some quiet fan operation. The fans are different heights. Stock is about 9.9mm and the Noctua is 11.9mm (on the corners). I wouldn't say that fit is "perfect" - the shroud does not fit correctly. Also, the plugs of the fans are different, so the cables for both fans have to be cut. When removing the fan the entire socket pulled off of the mainboard. I wouldn't recommend anything about this. Thanks for mentioning. I had posted and talked with a user on an ACEPC AK1 site here. He had mentioned it fit so that is what I was going off of. I have been trying to find an adapter, but like the AK1 post and you mention it looks like the Noctura fan does need to be cut. Thus I have been looking around to hopefully find a lead that I can use that would fit the Replay, and then I could just hack away at the Noctura and pair it with the lead. Then plug it in and save the stock fan in case I need it. Matt has mentioned he believes the fan connector is a 3-pin JST SH connector, 1mm spacing and that the center pin is not used. However Mike has mentioned he would talk with the manufacture. I am keeping an eye on SH connectors until I hear back from Mike to make total sure before I buy some leads. Once I hear back for sure i'd like to at least buy some leads and give it a shot. While not a plug and play solution some users that are able to might want to give it a try to stop the fan noise that they don't like. With the fan and good thermal paste installed it will also be safer to run Dolphin over clocked to help get GameCube games running better. Would this fan fit the bill? It is a blower style, so it pulls air from the top and shoots it out the side, just like the current fan does. The Noctua fan mentioned, above, is 17.9dba and this one is 18dba - so the same noise level. It comes in a set of 4, but I think I will buy it and try it out...my fan started to rattle something terrible. I could not find the airflow for the blower fan to compare them. Last edited by cybrsage on Wed Jan 30, 2019 10:36 pm, edited 1 time in total. As for the connector, it does appear to be a JST 1mm connector. If you look at this Amazon link (cheaper, but only one cable), you can get a good close up shot of it. I looked at the one in the Replay under a magnifying glass and they appear identical. I tried to measure it with a ruler - but 1mm is just so hard to measure that way. It appears to be 1mm between the leads, so it should fit. I am going to go ahead and buy the fan set from my previous post and this cable and let you all know if it works. I will snip the unused yellow wire and electrical tape over the end, since only the black and red are used. Would this fan fit the bill? Size wise it looks okay. You are correct in that it is a JST. I wanted to try to use the Noctua because it is know for being cool and quiet. However I ran into a snag trying to splice a blank connector to it. I tried it a few times with no luck. I ended up sending the fan I bought to Mike to take a look at and see what he can do. However since they have been busy I am sure it is on the back burner until things get back to normal. 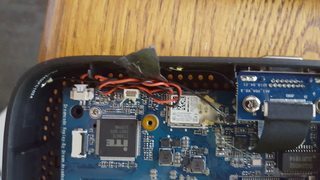 If you are going to try to swap the stock fan out yourself make sure you warm up and loosen/remove the glue around where the plug is plugged into the board, and be gentle when removing the stock connector. 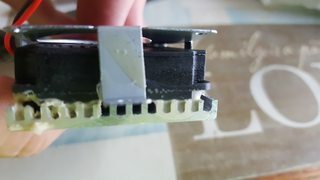 The glue can be stronger then the connection between the connector and the board causing the entire plug to come clean off the board. Thanks, that is a vital tip! I will post in a few days when the parts arrive. Just an update to say the parts are still not here yet...Amazon says February 11th. Last edited by WheatPasta on Mon Feb 04, 2019 6:15 pm, edited 1 time in total. The fans got here, but not the cables...sigh, what are you doing to me Amazon! But for comparison, the new fans I purchased look identical to the one used in the Replay from the factory, just a different brand name on it. Also, the heat sink does not rest low enough to sit on the CPU if you wanted to use Arctic Silver instead of the sticky pad. I tried it, you would have to use a layer of paste as thick as the pad, and I am sure that defeats the purpose. I did put some Arctic Silver on the heat sink and the CPU, which then has that sticky pad in the middle of it so it actually touches. Thinking of splitting the cable to the fan and running a second one to blow across the heat sink and CPU from the side - the really help with cooling. The fans I bought are quite noisy. I decided to completely revamp the cooling system. 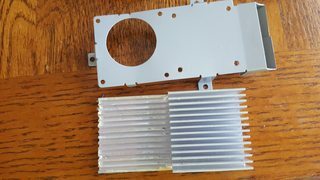 I removed the heat sink and foamy tape and installed a 40mm x 40mm CPU style heat sink I had sitting around, and used Arctic Silver as the paste. I tied it down with a metal wire and screw setup I had left over from an ancient heat sink setup I had from decades ago. Works well to hold the heat sink in place. 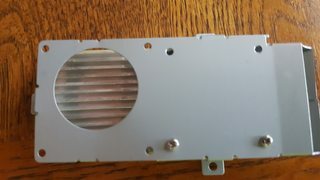 I just received two USB silent fans, which I will use to cool the CPU and motherboard, routing the cables out the lid. Most likely I will use a Dremel to cut a small notch in the case for the cables to exit so the lit sits on flush still. I hope to do this today.